Congratulations! We know how many decisions there are to be made when planning a wedding, and your wedding wine should not be the hardest one! We have put together a couple of packages to make that decision easier. If you wish, we can also create a custom label for your event to make it your very own! Just contact us to discuss all your options. Before you commit to making wine for your event, check with the hall to make sure they will allow you to bring your own wine, and how much they will charge as a corking fee. Also, make sure to look into the necessary Special Occasion Permit (liquor license) to ensure that you meet all the requirments. Whether you are serving wine with your wedding dinner, serving it before the dinner, or giving it out as gifts, we generally recommend you go with something that's popular and well-known. The most popular white right now is Pinot Grigio, and the red is usually Merlot. While these are the wines that have the broadest appeal, they may not work for you. We will work with you to make sure you choose the wine that suits your taste and pocket book. Please note kit wines, like commercial wines, are best appreciated after some cellaring. How much time is recommended between bottling and drinking the wine depends on the brand and wine style. Let us know how much time you have when choosing the wine so we can help you make the right choice! 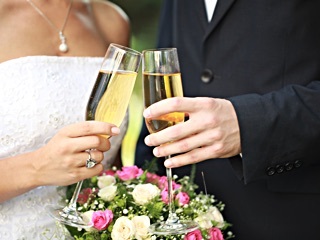 If you're looking for more information, try this link from our partners at Global Vintners; http://www.myweddingwine.ca/. Designed and produced by Paradime Design and IT Solutions.